Grayson Lacey was admitted to the Mississippi Bar in 2006 and is a shareholder with Burson Entrekin Orr Mitchell & Lacey, PA His litigation practice is focused on medical malpractice defense, railroad law, insurance defense, federal litigation, and employment law at the trial and appellate levels, and he is admitted to practice in all State and Federal courts in Mississippi, as well as the Fifth Circuit Court of Appeals. 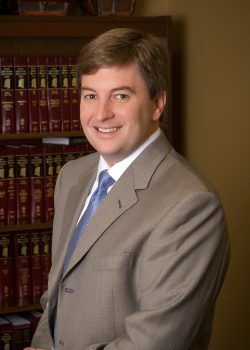 Mr. Lacey obtained his undergraduate degree from The University of Mississippi in 2003 and his Juris Doctorate from The University of Mississippi School of Law in 2006. He is a member of the American Bar Association, National Association of Railroad Trial Counsel, Defense Research Institute, the Mississippi Defense Lawyers Association, the Jones County Bar Association, and the Jones County Young Lawyers Association. A lifelong resident of Laurel, Mr. Lacey is active in the community. Along with his wife and son, he is a member of the First Baptist Church of Laurel. An Eagle Scout, Mr. Lacey is an active supporter of the Boy Scouts of America and serves on the Friends of Scouting committee for Jones County. Mr. Lacey is also a member of several local philanthropic organizations, including the 100 Club of Jones County.